TOP 3 reasons why you don’t NEED a nerve conduction test for Carpal Tunnel. What I want to say is “WHY”??? Why do you feel you need one and why do you want to wait? I know that your doctor may have recommended it and you want to do what your doctor says. I get that because we are taught at an early age to trust them. So often, patients feel that a nerve conduction study is going to give them answers as what is going on and what needs to happen. While there is an important place and time for a nerve conduction study, most of the time they are overused and can lead to a delay of actual help you can be receiving. Hopefully the education below will help you make a more informed decision as to whether you need to spend your money or time on a nerve conduction study. A nerve conduction test just gives you a snapshot of how your nerve is damaged or dysfunctional. For the carpal tunnel, they are only looking at the wrist area. Mild. Moderate. Severe. But it doesn’t give you a reason why it’s damaged or if the root cause is at the carpal tunnel area. Where you feel it in the hands may be caused at another level like your shoulder or neck. It must make you must wonder, is this something that has been there or is it truly a problem. You will not know without a thorough evaluation and to see how your body responds to treatments. Always try to conservative care and find someone who is an expert in finding the solutions to the problem. Not treat a symptom of the problem. 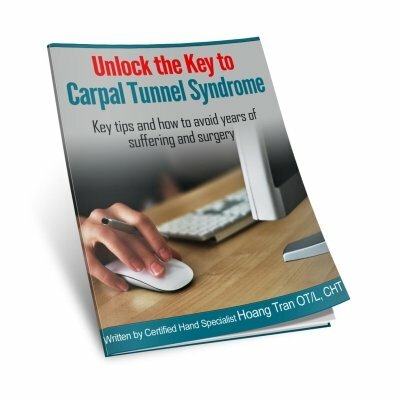 Do you JUST have carpal tunnel or are there other factors going on that is giving you all these problems with pain and numbness? I always say it’s not just one thing and it’s not always just where you feel the problem. I’ve had people that had carpal tunnel surgery because their test came back “positive for carpal tunnel” and they had the surgery because they can’t live with the pain. When they come in for therapy, they are still in pain even months after the surgery. OR they waited for the nerve conduction test and the doctor recommended surgery and they said “no I want to try therapy first” and it turns out all their pain is not just in their hands but we helped fix shoulder and thumb problems and voila! They don’t have the hand pain all day and “numbness” that they were feeling before. So, if you want to have the nerve conduction test….I’m not saying don’t do it….I’m just saying that you don’t have to WAIT to actually get the help that you need and that it is possible to get relief from your symptoms without waiting for a test. What will the test help you do? It’s time (multiple doctor’s visits) and money to get this test done….and what will it do for you? Do you still need the help to get rid of your hand pain and numbness? Are you ready to have painful surgery where it will take months to recover? If it’s a decision you are looking for, we can help clarify what can help you with carpal tunnel in the clinic with some specific tests and treatments to get you the results that you are looking for. With all that said, when we get people that present with red flags, this is an issue and testing is needed AND recommended. It is just that testing sometimes gets overused to sitting down and having a conversation and talking about what you are looking for and what is really going on to get a big picture of what is possible. It is like research. We have 2-3 possible problems. Now lets’ rule in or rule out those possible problems. I always like to ask people who come in to talk to us… Is this nerve conduction test going to change the outcome of the direction you want to go? My most recent graduate waited at least 2-3 months continuing to suffer with both hands painful because she wanted to wait for a nerve conduction test. It basically told her that she had the same severity of nerve compression as she did when she did the test many years prior. Only this time, the pain was worst but the results where the same….the doctor recommended surgery….so I asked her the same question. And she told me that she didn’t want surgery and wished she had come in sooner than waiting to do all the testing because she really didn’t want surgery….on both hands. We provide an effective Carpal Tunnel Therapy Program in Miami and Doral that DOES not require surgery! Most want to go down the route of conservative care…. Someone who will spend time with you to answer your questions and explain what is going on…so you can make the best possible decision about what to do next. Request to Talk with Our Carpal Tunnel Specialist today….whether you decide to do the nerve conduction test or not.